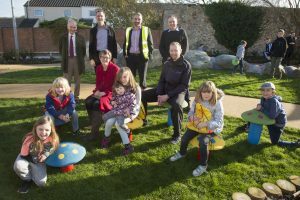 Cartrefi Conwy green project is child’s play with a giant caterpillar | News by Wales Express News, People Before Profit! A scruffy piece of overgrown land has been transformed into a “green oasis” featuring a giant caterpillar made out of boulders as part of a £1.2 million environmental scheme. According to housing association Cartrefi Conwy, the aim is to reconnect youngsters living on the Tre Cwm estate in Llandudno with the natural environment and give them somewhere where their imaginations can go into overdrive. The estate is also benefitting from redesigned roads, setting out car parking spaces, footpaths and changing concrete areas into green spaces – all brightened up by a major programme of planting trees, shrubs and flowers. 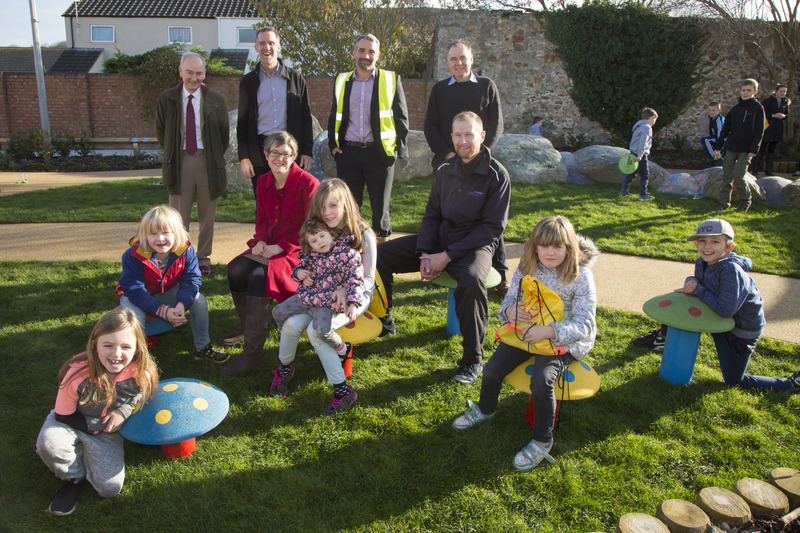 Cartrefi Conwy Green space and play area officially opened, Cwym Howard, Llandudno; Pictured at the opening with some of the Children from the estate are Katy Woodington, Cllr Phillip Evans, Owen Veldhuizen, Howard Vaughan and Neil Pringle. The work comes on top of the £2.75 million already being spent by them to improve the estate’s houses, flats and maisonettes which were built in the 1970s. The two projects brings the total invested by Cartrefi Conwy on its housing stock of 3,800 homes in Conwy to over £40 million with more than 300 jobs created as part of their ongoing housing improvement programme. At the official opening of the new space, environment development officer Matt Stowe explained the environmental makeover was designed to turn sections of unused and neglected land on the estate into inviting pleasant green spaces. The first area of the estate, backing onto Maes y Cwm Road, has been completed after six weeks of work. He said: “This is a family estate and we want the opportunity for play to filter through the whole estate. “This first completed green space is just one of what will be around six or seven green spaces all conducive to play we are building around the estate. The area was overgrown and unloved. We consulted with children and asked what they wanted. “It was clear they wanted natural materials used so we collected huge boulders that lay around the estate and used them to form a giant caterpillar which children can play and climb on, chalk over and generally use for play. “We have also designed a grass maze and when the grasses grow it will be suitable for very young children to play in and around. “The whole area has been designed to be low maintenance but high in play value. Tenant Helen Allen said: “It’s fantastic and a huge improvement. This area was just waste land and unused. It’s now giving children space to play. And the giant boulder caterpillar is amazing. The Tre Cwm Green Space Project is being supported by Gwynt y Mor Wind Farm who pumped £65,000 into the scheme. Gwynt y Mor grants manager Neil Pringle was delighted with how it has been transformed from what was waste land. Katy Woodington, Senior Community Investment Manager, for Innogy which operates Gwynt y Mor Wind Farm, said: “It’s amazing to see this shared space and children enjoying play. Howard Vaughan, managing director of Brenig Construction, the contractors who completed the work, was equally delighted with the outcome. He said: “It’s been a pleasure to be involved in a project that has delivered this transformation to the housing estate. “We have gone from an unused and overgrown piece of wasteland to something that is both fantastic and a space that can be used by the whole community. It’s great seeing children playing and using the area exactly how we intended. Conwy Country Borough Council’s Tudno Ward Councillor Phillip Evans congratulated Cartrefi Conwy for the environmental work being undertaken on the estate. He said: “It’s a wonderful improvement from what was an unloved and overgrown area. It’s clear a great deal of thought has gone into what has been done and the area is now a fabulous facility for the whole community. It was music to the ears of Cartrefi Conwy’s community regeneration manager, Owen Veldhuizen. He said: “I believe this area will be of benefit to adults too. The raised beds are filled with evergreen and deciduous bushes and plants that will reinforce the seasons.